I recently attended a thought-provoking lecture by Terry Hunt titled “Rethinking Easter Island’s Mysterious Past.” Dr. Hunt, formerly of the University of Hawaii and currently dean of the Clark Honors College and professor of anthropology at University of Oregon (my alma mater), has done extensive research in the archeology and environmental history of the Pacific Islands. For a dozen years Hunt has directed archeological research on Easter Island (Rapa Nui) where his team developed the astonishing theory that the famous giant stone statues had been “walked” to their positions around the island. 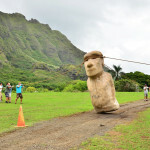 National Geographic Magazine featured Dr. Hunt’s research as its cover story in the July 2012 issue, and a few months later PBS aired a Nova-National Geographic TV documentary that showed his team rocking a full-scale statue replica forward on Easter Island. In the course of his research, Dr. Hunt has also revised the timing of the Polynesian settlement of Rapa Nui to about 1200 CE and called into question the cause of its demise in the 17th century. The traditional theory of migratory Pacific settlement (that I have taught, as a World Civilizations instructor) is that sea-faring Austronesian people first settled the Bismarck and Solomon Islands east of New Guinea by about 4000 BCE. By about 1500 BCE they had acquired the sophisticated maritime technology to sail greater distances, as well as food crops and domesticated animals to carry with them. Sailing in large twin-hulled canoes they fanned out through Oceania, the earliest probably heading eastward, reaching the Polynesian islands of Fiji by 1300 BCE and Tonga and Samoa by 1000 BCE. Other mariners set out eastward from the Philippines to settle the small islands and atolls of Micronesia including the Mariana, Caroline, and Marshall Islands (likely rejecting tiny Wake Island, devoid of fresh water or soil). These early mariners knew to follow seabirds and to watch for floating debris to help them find land. Meanwhile the Polynesians ventured farther into the eastern Pacific, to Tahiti and the Marquesas, and finally to the most remote reaches in the first millennium CE, requiring unbroken voyages of thousands of miles to Hawaii, Easter Island, and New Zealand. Estimates of the Polynesian settlement of Easter Island have ranged from 300 to 900 CE. The prevailing theory is that by 1200 CE the pressures of population growth and competition on Easter Island prompted an obsession with production of massive stone sculptures. Researchers speculated that now-treeless Easter Island had once been covered with millions of palm trees which were felled in a frenzy to provide the rollers, sleds, and structures to move and raise hundreds of statues around the island. Deforestation, famine, and civil war ensued causing population crash and bringing the Rapanui to cultural and environmental collapse by the time of the first European encounter in 1722. Jared Diamond, UCLA geographer and author of Collapse: How Societies Choose to Fail or Succeed (2005), argues that “Easter Island’s isolation makes it the clearest example of a society that destroyed itself by overexploiting its own resources,” an “ecocidal” warning to us all. But Terry Hunt’s research has turned that scenario on its head. First, recent application of radiocarbon dating technology suggests a more recent and rapid Polynesian colonization of Rapa Nui around 1190-1290 CE. The settlers brought chickens, rats, and taro agriculture, though the island’s sparse resources would limit population growth to a few thousand. Over the next few hundred years deforestation resulted from agricultural transition and the fact that, with no predators, Polynesian rats multiplied and found a ready food source in palm seeds. As the population grew, rival clan groups competed by carving nearly a thousand moai – some as tall as 30 feet and weighing 75 tons – representing revered ancestors. The Rapanui transported about half of the statues miles from the quarries where they were carved to their coastal destinations where they mounted them on stone platforms, facing inward to watch over their descendants. But the moai were not rolled on felled palm tree over the rugged terrain. Hunt and his team studied the base angles of the statues still in quarries and the fallen, broken moai across the island and experimented with alternatives until they achieved a breakthrough: tilted upright and roped at the head to three teams, one to each side and the strongest in the rear, the statue could be rocked back and forth, pivoting on its base in forward motion. At the platform the statue’s base was leveled and it was raised to straight upright position where it could keep its eyes on the people. In the 17th and 18th centuries European mariners arrived, bringing the catastrophic diseases that decimated native populations throughout the “new world.” Chile annexed the island in 1888. There are many more fascinating details to this story, but one that caught my attention is that the Rapanui placed most of their moai on stone platforms (which also served as burial sites) located near vital fresh water sources that were exposed at low tide. Easter Island has a couple of volcanic lakes, but lacks permanent fresh water flows. To sustain life on the remotest of remote Pacific islands, the Rapanui marked and protected precious water sources with their most powerful defenders: their ancestors. The extended story of Rapa Nui’s prehistory can be found in Terry Hunt’s recently published book, co-authored with Carl Lipo, The Statues that Walked: Unraveling the Mystery of Easter Island (Free Press, New York, 2011).